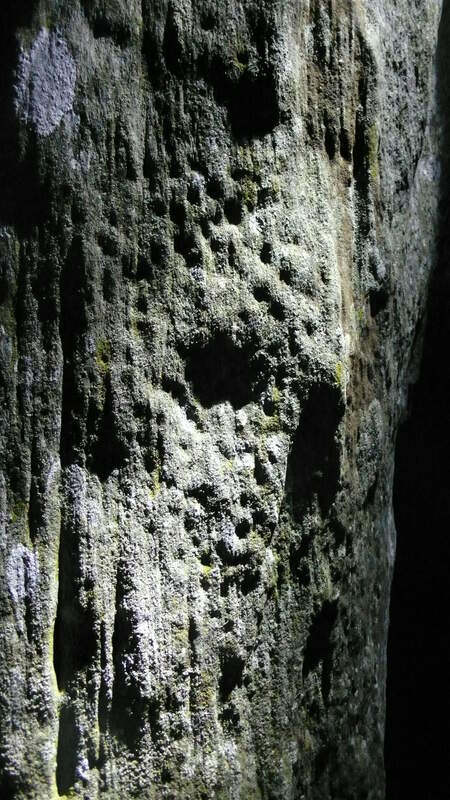 “Cairnholy Joe” – a man on a mission; to enlighten visitors to the eponymous chambered cairn so that they might understand the meaning of this “monument”. Now this is not a conventional view purely based on the archaeology – way too prosaic – much more than that it is an aesthetic view of the world seen through the lens of the remains of this most architectural of prehistoric structures. Now there are many simple yet impressive Neolithic structures around the country but not many people seem to spend so much time observing the world from one such place these days. It seems many people you meet who have visited here also encountered this aesthete whose name it turns out is Joseph Proskauer who describes him self on his blog as: “Lives with his wife and many other creatures, slightly below the surface of earth, toward the point where the sun sets in the dark days of winter – as seen from Cairn Holy.” Unravelling the mysteries of Cairnholy appears to be his destiny. He has studied in infinite detail the relationships between the stones and solar and lunar alignments so that the eight standing stones of the forecourt perform as some sort of complex sundial fulfilling the necessary calendrical functions and spiritual insights of the Neolithic people who constructed it. After some interesting discussions around the subjects I was advised to cross the neighbouring field where a dead straight path had been worn, presumably by himself and his “pupils” (or was it Alfred Watkins Old Straight Track! ), and approach the forecourt and observe – this is how it looked. Now being one who is interested in the relationship of prehistoric archaeology has to landscape I noted that it appeared that the focus of the structure from this direction was one of two rounded hillocks on the skyline; perhaps echoing the female form. Wrong! 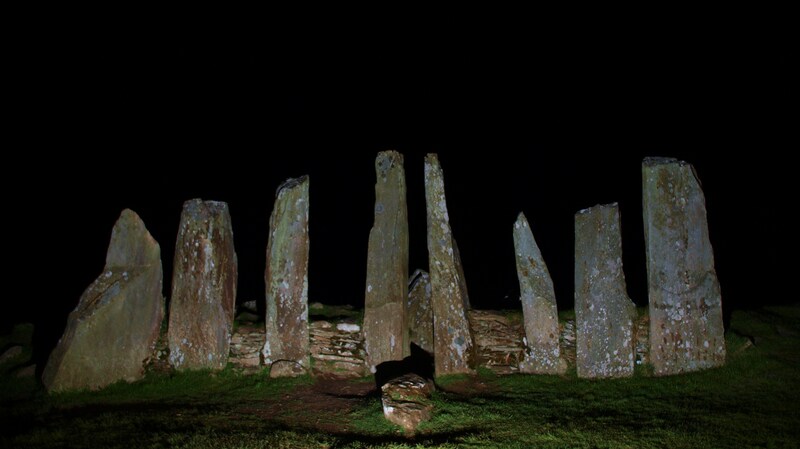 I should have been observing the stones – in particular; that whilst the four stones on left hand side of the forecourt curved in a slight arc those on the right were straight, but also the three outside stones of each side both rise to the right (north). These are certainly intriguing observations although I was not paying enough attention at the time to remember the import of this piece of the jigsaw. Of course there were many other observations Joe made including the unrecorded weathered pecked area of rock and cup mark on the edge of one of the southerly orthostats. 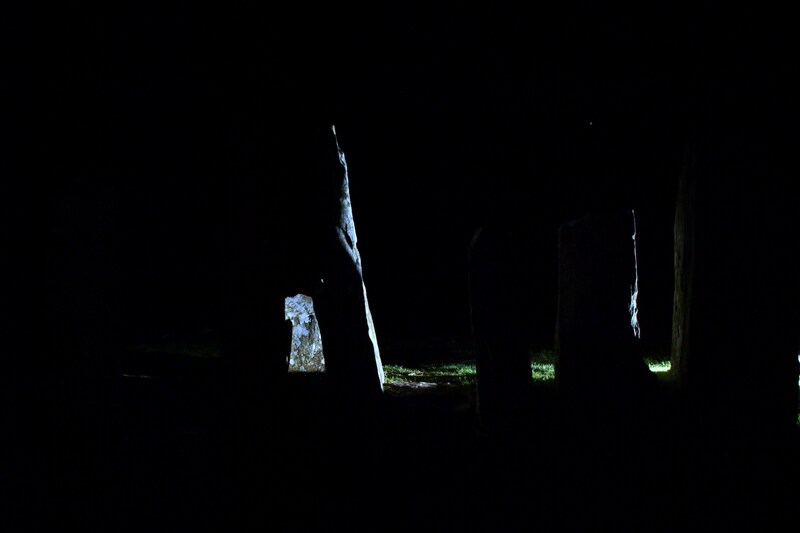 Virtually invisible when the sun is high but on return to the stones in darkness and controlled lighting it came alive. In darkness my own senses were heightened, as peoples must have been in prehistory when viewed at night – the stone would be seen to dance in the firelight – hearths were found in the forecourt when the site was dug by Stuart Piggott and T G E Powell, whose report can be seen here. 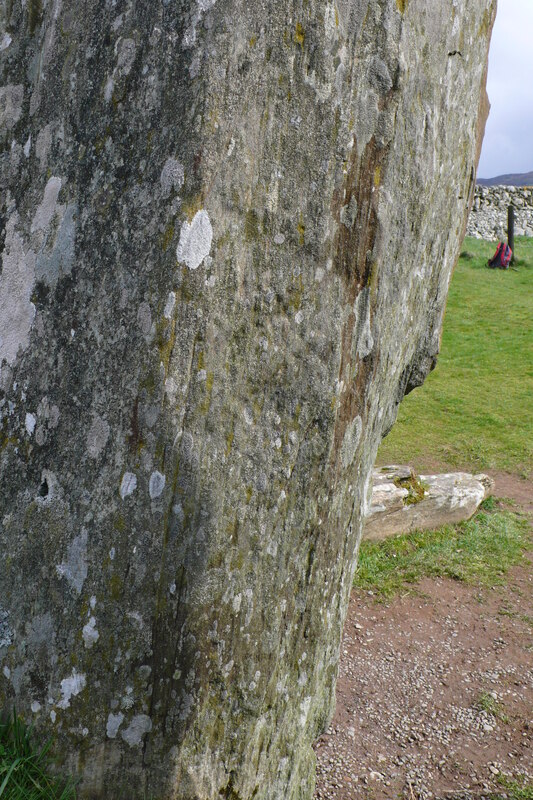 Although Piggot and Powell found a cup and ring marked slab placed in the chamber along with a slab disturbed from the cairn marked with cup and rings they missed this marking of the facade stone. We can pehaps only speculate when this mark was made as it was likely that the walling between the orthostats would have covered this mark when the structure was first built. This is one of the rare occurrences when cup and ring marked rocks are found within a chambered cairn the other notable example being in Dallaides Long Cairn, also a rare piece of burnt jadeite axe from the Italian Alps was found here. So people have been doing pretty strange things here for millenia. On reflection despite Joe’s apparent disinterest in the factual elements of the archaeologists excavations and his apparent oversight that the reconstruction of the facade sixty five years ago means that it is most likely that it was not as we see it today when it was first built. His reconstructions of the points of the stones with clay may also be speculative but we can perhaps never be sure that it was not so and that the things he sees in this structure are as not valid as the interpretations put upon these most architectural of structures by archaeologists. Maybe it is as important how these structures feed back to modern people, be they believers in Neo-paganism, Wicca or Witchcraft, Earth Gods or Goddess’, any of the more mainstream religions or combinations of any or all of these. Who knows if it was not always the case that from their inception people have drawn different inspirations or energies from these places. Acknowledgements and Notes; Thanks to Joseph for stimulating conversation! I was reminded of my meeting with Joe after seeing a blog by Upland Pete on Cairn holy. These meetings came about from a cottage rented below Cairnholy in 2012 and occupied by three archaeologists (rock art fiends) a story teller and an architect, thanks Kate, Tertia, Debbie and Anthony. Just visited a similar stone row that is also organised in a slight arc. Lunar alignment, apparently. Great title for the post! Yes, I can see that that might be so, may also explain why some cup marks seem to be arranged in a crescent. I was lucky enough to join Joe for the vernal equinox – if you can try to be here next year – amazing! So we happened to visit Cairn Holy at around noon on Christmas Eve – the first sunny day since the winter solstice. Is it likely that the two elderly ladies being educated by Joe had arranged to meet him or were they in a benign hostage situation? It was fun but slight panic ensued when our six year old daughter ‘cleaned’ the mud off the stones with 2 minutes to go til 12:18 (sun’s highest point). Thanks for the comment Pamela, no ritual sacrifice incurred, sounds like a close shave!